Wood duck nest boxes can be constructed from different materials; sheet metal, fiberboard, plastic, and cardboard. Each has advantages and disadvantages but wooden boxes are generally considered the most attractive, blends in well with the natural environment and wood ducks seem to accept wooden boxes faster than other types. Regardless of type, there are some fundamental charateristcs to consider. 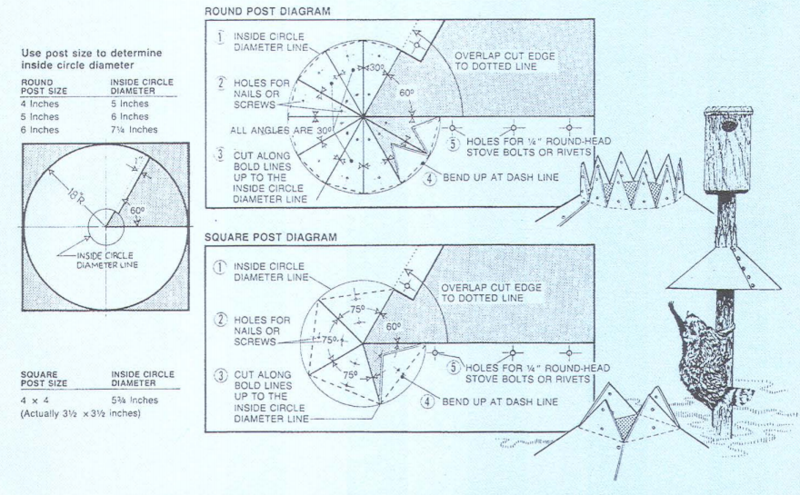 Inside dimensions should be approximately 10x10 inches or at least a 10-inch diameter. The entrance hole should be approximately 3x4 inches and oval. There should be some type of duckling ladder inside the box, such as a strip of hardware cloth, for the ducklings to climb to reach the entrance hole. The box should have drainage holes and some way to open the box to clean out old nesting material. We recommend wood shavings, 4-6 inches deep in the bottom of the box. Shavings should be from untreated wood. Cabinet makers or shops that make wood moldings are good sources for wood shavings. Shavings work better than sawdust alone, because sawdust tends to hold moisture. For the best nest success, boxes should be placed on posts or pipes equipped with predator guards. Mounting boxes on tree trunks is not recommended. Its nearly impossible to deter nest predators from these boxes. The most common predators of wood duck nests in Florida are gray rat snakes and raccoons. The 3x4-inch oval entrance hole will exclude racoons larger than 10 pounds. Further protection from racoons and snakes can be achieved by adding a flat or conical metal shield below the box, extending at least 18 inches from the post in all directions. Make sure the guard meets flush with the post, because snakes can squeeze through very small gaps. Your best chances of success will be with boxes placed in wetlands where you commonly see wood ducks. Place boxes so that the entrance hole faces an opening in the lake, pond, or marsh. This orientation helps birds notice the entrance more easily and may entice wood ducks to use your box sooner. Place the boxes about 6 to 10 feet above the ground or water surface. 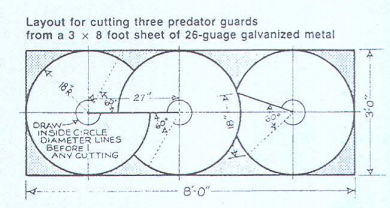 If the water level fluctuates, the predator guard should remain about 3 feet above the high water level. Boxes are best placed over water the water offer the best protection from predators. Woodies will readily nest in boxes on land, but risk of exposing the nest to predators is higher, and ducklings are especially vulnerable when they have to cross land to get to water. Finally, keep in mind that you will need to maintain the boxes annually, so place them where they are convenient for you to reach, with a ladder, tools, wood shavings, etc. We recommend that boxes be at least 100 yards apart and visually isolated so that you cannot see one box from another. 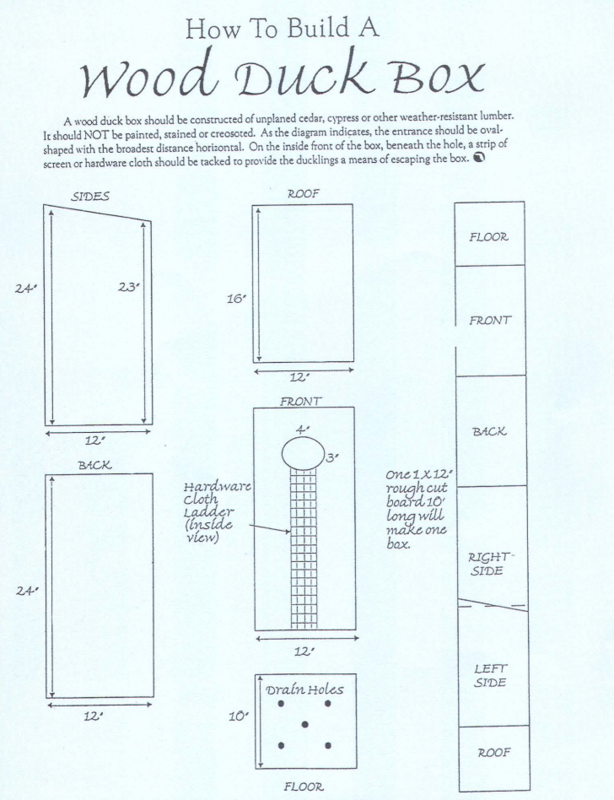 The plans for building a nesting box are supplied below. We recommend using rough-sawn (unplaned), cypress or cedar boards, 1x12 inches. One box requires 10 feet of board. The wood should not be painted, stained, or chemically preserved. Examine boxes in December or early January to make sure they are in good repair and ready for the upcoming nesting season. Remove any remains of last year's nests, including unhatched eggs, larger egg fragments, and down feathers. Occasionally, you may need to dump everything inside the box and replace the nesting material, particularly when it becomes badly matted, soiled, or infested with fire ants or other insects. Make sure the box has at least 4-6 inches of suitable nesting material. Beware of and eradicate wasps, which find wood duck boxes attractive places to nest. Avoid applying wasp spray or other contaminating chemicals inside the box, especially on the nesting material. Make needed repairs such as split lids, loose hinges, latches or pulled nails. Make sure the hardware-cloth ladder on the inside of the box is in place and has no protruding wires. Check the predator guard for any needed repairs. Several other wildlife species find wood duck boxes good places to nest or roost. These species include gray and flying squirrels, bats, screech owls, great crested flycatchers, Carolina wrens, Carolina chickadees, eastern bluebirds, flickers, and tree frogs. You may see evidence of these animals when you maintain your boxes. It often takes a few years before wood ducks find and accept artificial nest sites, even in areas where you commonly see wood ducks. Once the birds do begin to use your boxes, use likely will increase quickly. Remember that after a hen successfully nests in a box, she usually will return to the same box or group of boxes to nest the next year, and so will any female offspring she produces. 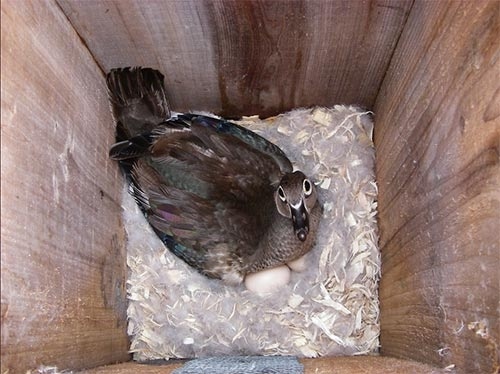 Although adding nest boxes can increase wood duck populations on a local scale, most of Florida's breeding wood ducks nest in natural cavities. To be large enough for nesting wood ducks, these cavities must occur in fairly large, old trees. Therefore, the welfare of Florida's resident wood duck population depends on conserving and managing mature forest stands in conjunction with healthy and productive wetland habitats.